Pureformance Freeze Dried/Grain-Free Dog Food Pureformance™ Pet Food is a whole new approach to freeze-dried pet food. Their delicious selection of unique proteins are accompanied by highly nutritious chickpeas, fruits and vegetables. Chickpeas are valued for their high protein and extremely low glycemic index. 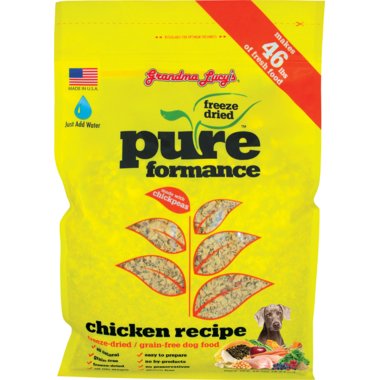 Grandma Lucy's Pureformance™ uses simple ingredients to bring your pet the best simple nutrition. For each cup of food add 1 – 2 cups of warm water. 3lb bag makes up to 14 lbs of fresh food. 10lb bag makes up to 46 lbs of fresh food. Ingredients: USDA Chicken, Chickpeas, Flax, Carrots, Celery, Apples, Bananas, Blueberries, Cranberries, Pumpkin, Papaya, Spinach, Garlic, Vitamin A, Vitamin D3, Vitamin E, Niacin, Iron, Calcium, Phosphorus, Zinc, Riboflavin, Thiamin, Potassium, Manganese, Chloride, Copper, Magnesium, Pyridoxine, Cyanocobalamin.